An option for the standard basket valve is the H&S Flop Valve equipped with an internal “flop” plate spout that directs product to the desired outlet position. The “A” style 2- way Flop Valve has both outlets offset for 45, 50 or 60 degree flow. The “K” style 2-way Flop Valve has one straight through outlet and the other outlet offset for 45, 50 or 60 degree flow. The 3-Way Flop Valve has one straight through outlet and two offset outlets for 45, 50 or 60 degree. The standard sizes for Flop Valves range from 6″ to 24″ inlets/outlets. Valves can be operated by pneumatic cylinder, electric linear actuator, spring-loaded manual operator, electric rotary actuator or hydraulic cylinder. 3-way valves have two operators. 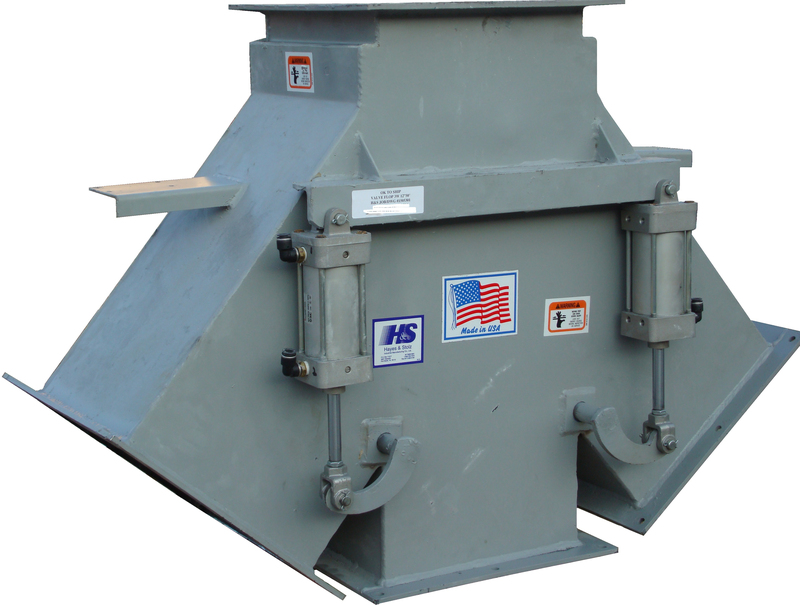 See Features/Options tab for available options for Hayes & Stolz Flop Valve Diverters.